Through the years, I have been hearing problems from fellow hams over the air, and even in personal eyeball communications, about how they can organize and implement a good and effective Radio Frequency Interference (RFI) free grounding system in their ham shack. Some of these problems I heard are in parallel to the same problems I experienced in my early years of this hobby. Most new hams who operated mostly in the VHF and UHF band enjoyed their operating until later when they upgraded to the HF bands, and problems immediately cropped up. The first time they pressed the PTT and start talking in front of the microphone, all active equipment in the shack went haywire. Panel meters went crazy, the power supply volt meter jumped up and down, and if he was unlucky, he may have got his first microphone bite to shock him by surprise if the base microphone case was metallic. Second - Dealing with RFI in the shack (RF grounding system). When transmitting, a distorted audio is heard over the amplified speaker of the PC desktop. Severe Radio Frequency Interference (RFI) to home appliances within the vicinity of the Ham shack. All of the above are the major signs and symptoms of the presence of high RF voltages within the immediate vicinity of the ham shack when the transmitter is active. And these are all attributed to poor RF grounding. All conducting objects will absorb RF energy through coupling and will re-radiate the same. One can say “But I have already a very good electrical ground!”….. Fact? Or fallacy? If you experience any of the above problems within the shack, I am pretty sure that you are suffering from a plethora of grounding and Un-Grounded ham shack problems. Let us analyze some scenarios of grounding systems typically complying with good electrical safety but which are poor RF grounding systems. An anthology of a simple case scenario and a worst case are presented and the possible problems that may arise at the instance the transmitter becomes active. This ham operator was a neat fellow. One day, he finally convinced the xyl to let him setup his own radio shack, away from the prying eyes and itchy fingers of the family kids. And so he built his own radio room on the ground floor of the home QTH. He arranged his equipment and built a good electrical ground system by laying out a heavy copper wire about 3 meters long just behind the neatly lined up station equipment. He decided to run the ground wire straight so that each equipment ground lug can accommodate a short flexible grounding wire to reach the ground bus. He did this to all of the station equipment with a very neat connection so that the individual grounding wires did not get meshed up and entangled. The remaining length of the ground bus was led outside to an effectively driven ground rod just outside, near the wall of the Radio room. This grounding setup looked like the one shown in Fig. 1. The individual station equipments already have their own ground reference but when they are interconnected, grounding each equipment to the main ground bus as shown in Fig.1 creates GROUND LOOPS. Each time a ground loop is created, a small inductive coil is formed (the ground wire completes the loop). When the ground loops are in the near field of RF energy (During transmit mode), these loops will couple to the RF energy (called RF coupling). As the RF energy is coupled to each loop, a fluctuating voltage is induced in unison with the burst of audio modulation of the RF energy. This energy will flow within the system and will seek the least resistance by following the associated circuits and eventually creeping into other internal circuits. Once the RF is inside these circuits, it will interfere with the normal operating parameters of sensitive circuits thereby creating havoc. RF bleed-over escaping from long interconnecting coaxial cables may also flow within each loop, bathing the whole shack with RF energy. His new ham shack has an excellent DC electrical ground system but has a VERY POOR RF GROUND SYSTEM! Dismantle the present ground wire configuration. Remove the long ground bus and terminate all ground wires from each equipment into a single point near your ground rod. The problematic ham scribbled quickly in a piece of paper and came up with a final wiring that looked like the circuit shown in Fig. 2. They both agreed on the modifications and promised to contact each other at the same time the following day and then signed off. Came the following days contact, the problematic ham called the Elmer and got an immediate reply. "Hey ol’ man", the Elmer said, "you have a beautiful signal, clean and kicking!" After a short pause came a reply… "Yeah thanks!" They exchanged an extended pleasant QSO and finally parted. The audio problem was solved and he was happy ever after. One day, during the next several rag-chew sessions on the same band, a third station joined the QSO. His signal was strong but the audio was also thin, fuzzy and garbled every time he raised his voice over the microphone. RF was all over the ham shack. He told the Elmer that every time he spoke over the microphone, the voltmeter of his regulated power supply jumped up and down the scale. The screen of his computer became fuzzy, and his lips were bitten with electrical shock if they touched the metallic case of the microphone. One night, while working a DX QSO, his Xyl came to the shack to give him the regular good night kiss. Holy cow! She and he received a mild electric shock the moment her lips touched his ear lobe! Also, he was threatened several times during the early evening QSO sessions by marble sized stones dropping and rolling down his roof top apparently thrown by close neighbors irked by the RFI to their TV, stereo and radio sets. Each time he transmitted, his Donald duck’s voice was heard over their radio sets. In the next “over”, the Elmer said, “It will take us quite long to discuss the reason why you have an ungrounded ground system. I suggest that I will send you a quick E-mail”….. When it comes, please read carefully and understand the explanations…. Asked his E-mail address, and then said 73…. Your ground wire is 30 feet long (9.1 meters); this length is very close to a quarter wavelength at 7 MHz. When you start transmitting at this frequency, your transmitter setup and antenna system will create an image of standing wave throughout the length of this wire. This is by virtue of the RF voltage induced due to resonance. If the long ground wire is ¼ wavelength long at the transmit frequency, this wire will resonate and will act as a radiating element. If the ground wire is less than a quarter wavelength, it will appear as an inductive reactance, the value of which is “Zero” (point “A”) at earth ground and “High” at the circuit ground point of the equipment (See Fig. 4, point “B”). The power of the transmitting equipment. The equivalent impedance value at point “B”. The length of the ground wire in wavelengths. And, the extent of RF to earth ground leakage existing in the whole setup in the shack. Hmmm…. That’s the reason why you have RF in the shack! Because you have an “ RF UNGROUNDED GROUND! Hi hi…." Below (See Table 1) are the voltage standing waves that develop at point “B” if you use different lengths of ground wire and, if the same parameters exist in your shack. The voltage values were calculated by interpolation using the wavelength factor. You are living in an extreme RF environment! You are lucky that you and or any of your family are not wearing a “pacemaker”. Otherwise, %$#@#!! You are somewhere in the fields of ambrosia by now! That level of RF in the vicinity of your shack will create havoc within its reach. Your own safety and the whole gamut of station equipment will be affected. Note also that whenever you increase transmit power, the voltage standing wave at point “B” will also increase! Of course, the above exercise in Table 1 is true if the actual impedance at point “B” is 1000Ω. Other impedance values will give a result of voltages other than those shown. Any load connected at this end will change the impedance value but the voltage ratios between the short and longer wires will remain the same. Bear in mind that the impedance at the open end of a ¼ wavelength wire is about 2000-3000Ω. The example above is based on these assumptions but it will approximate the actual values. In these calculations, the power transfer loss was not considered to simplify the example and emphasize the voltages so created. Also, if there is a wide mis-match between the antenna feed point impedance and the transmission line, a high voltage standing wave will result to a high VSWR at the antenna system tuner output terminal. This standing wave will aggravate the situation because this voltage will add up to the already existing standing wave created by the long ground wire. The result is catastrophic!. RF is all over the place….. Relocate the ground rod to be nearer to the shack so that the ground wire will be as short as possible and will not resonate. Use a short length of ground wire that will not be ¼ wavelength (or its odd multiples), or close to it, of the operating frequency. This is also the reason why your transceiver manual recommends not using this length of ground wire! Install the ground wire so that it will be far from telephone lines and main house wiring to prevent coupling of residual RF energy. Relocate the ground rod and drop the ground wire through another location to be as far as possible from your close neighbor. Three days later, and during the next weekend rag-chew, the troubled ham reappeared on frequency. The Elmer acknowledged him with this comment; Hey ol’man! Your signal is fantastic with booming audio. Crystal clear! What did you do this time? After a short pause, the troubled ham answered….. Yeah I have a new friend! Who? The Elmer asked. The troubled ham said…. my close neighbor! Many thanks hi hi! I followed your recommendations! They all continued the round-table QSO and happily exchanged notes. The Elmer learned that this ham had eventually relocated his ground wire, the length of which is now only 3 meters long. It was still a little bit long but the power supply jitter was gone and the RF bleed-over to the microphone circuit disappeared when transmitting at 100 watts PEP. The Ham was elated and thanked again the Elmer. Dealing with high RF in the shack has no simple answers but the paradigms exemplified in the above scenarios presented the basic concepts and remedial solutions to a seemingly perfect grounding system. Most new comers in ham radio forget the basic fundamentals of radio and the behavior of physical entities within the ham shack when exposed to RF environment. Forgetting the basic fundamentals and failure of the ham to apply these principles and fundamentals to actual practice predisposes poor safety practice, danger from exposure to high levels of electromagnetic radiation and destruction of equipment and other station accessories due to poor RF grounding techniques. That power supply in the worst case scenario will self destruct eventually due to the presence of high levels of fluctuating RF leaking into the sensitive regulator sensing circuit. Due to poor regulation, the transceiver will follow to say “goodbye”. The scenarios presented are extreme examples of real life experiences in ham radio practice. The two paradigms presented the basic problems and how to deal with each to reduce the presence of high RF levels in the shack. To exploit the complete elimination of RF down to zero levels will be a great feat, if not impossible, but reducing the RFI to such levels that will not interfere with sensitive equipment and circuits is enough to ensure safe and complete satisfaction to a continuing hobby. What if the troubled ham in scenario 2 cannot relocate his ground rod to be closer to the shack? What other recommendations can the Elmer suggest if the ground wire cannot be shortened? What if the RFI still persist after doing all the remedial measures recommended in Scenario 1 and 2? These are good anticipated questions. Not all amateurs are lucky to have their ham shacks installed in the ground floor of their home QTH. Many are the so called “Cliff dwellers”, meaning that their shacks are located in elevated floors, such as the third floor or higher in apartment buildings and condominiums. Such cliff dwellers may not have the benefit of shortening their ground wires towards earth ground. In spite of this situation, there are still effective measures to consider. Some of these are new and some are as old as the age of the ham radio world. This grounding technique is as old as the age of Ham Radio. The use of this technique dates back as early as 1895. It is used more effectively when earth ground conductivity is poor. But since your antenna per se also needs an RF ground to propagate efficiently at that higher elevation above earth ground (the reason of which, is beyond the scope of this article but maybe covered in future articles), it can be installed to perform the two functions. That is, to provide an artificial ground for the antenna when elevated high above earth ground and, to keep RF away from the station equipment. The setup is presented in Fig. 5 below. Cut each individual counterpoise wire exactly ¼ wavelength of each operating frequency. Connect one end of each to the single ground point terminal (see Fig. 5). Leave all the opposite ends free and floating (no connection). For better efficiency, stretch and spread each wire in a radial fashion, away from the station equipment as shown in Fig. 5. The position and orientation of the wires is not however critical so that you may want to anchor each at the side wall of the apartment building (of course you have to insulate the ends by using small egg insulators). Another alternate is just to let each wire dangle downwards but still the wires must be spread out. How you will do it will depend on your prolific imagination. Now, look for the longest wire (maybe the ¼ l 40 meter band counterpoise) that can reach the ground rod and designate this as your electrical ground. The idea is to use this wire to connect to your ground rod through a knife switch. When you are operating the station, the knife switch must be in open position. But when you stop operating and for safety reasons, you must provide an electrical ground. Run downstairs and close the switch. Remember however, to always open this switch whenever you sign ON the station. The counterpoise is in effect an artificial ground. One end of the quarter wavelength is connected to the circuit ground of the system (RF generator or transmitter) and the other end is left floating. When the RF generator is active, an image of the signal is developed in this wire and a voltage standing wave is induced. The magnitude of this voltage is similar to a ¼ wavelength antenna at various points along its length. The open end of this wire is high impedance (refer to antenna theory) while the opposite end that is connected to circuit ground of the generator is zero. It follows that the voltage at the generator side is zero (circuit ground) and the open end is high voltage. Notice that the high RF voltage point is now the reverse of the voltage points developed in the case of scenario 2 (See Fig. 4). By taking advantage of this characteristic, the use of the counterpoise will shift the high voltage away from the station equipment. If each operating band has its own separate counterpoise, then each respective counterpoise will function as the operating band is changed, allowing multi-band operation and preventing severe RFI in the shack. CAUTION! ---- The counterpoise wires will radiate RF energy. Make sure that the end of any of the wires will not extend near home appliances within your house and or near your close neighbors. 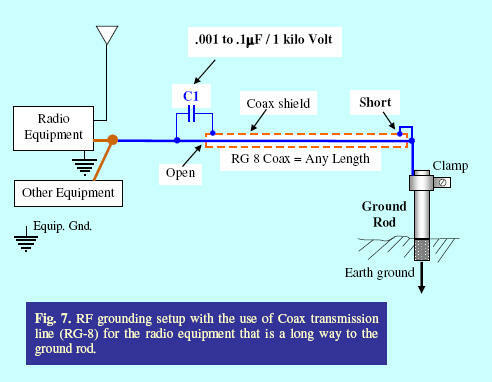 Installation of the RF suppressor – Remove the existing ground wire and replace it with a length of RG-8 coax transmission line, enough to reach the ground rod and into the shack to connect to the ground bus. At one end, short (solder) the coax shield to the center conductor of the RG-8 and the remaining pig tail to be connected (soldered) to a short heavy gauge solid copper wire to reach the ground rod (See Fig. 7). At the other end, strip the coax to reveal the center conductor and remove part of its shield. Connect the center conductor to the circuit ground of the equipment. Leave the coax shield open at this end but connect a ceramic disc capacitor (Marked as C1 = 0.001 to 0.1 μF / I Kilo Volt). One terminal of this capacitor is connected to the coax shield and the other terminal to the center conductor (See Fig. 7). The RF suppressor ground system is now complete. Of course the capacitor value is selectable depending on the lowest operating frequency band and length of Coax. The correct value is selected until RF disappears in the shack (at the lowest band). Or, when your lips doesn’t get to be burned or electrocuted (when touching the metallic mic case) as you speak or transmit. However, YOU MUST USE A HIGH VOLTAGE CAPACITOR RATING, about 1KV minimum, but the higher the better. Otherwise, ZAPPP!! !, this capacitor will explode if a surge of high voltage standing wave will develop instantaneously at or above 500 volts at this terminal. The circuit shown in Fig. 7 is an effective RF grounding setup. The author’s shack is in the second floor and uses the same grounding system which has been in use since 1989 with no RFI in the shack even when the 1 KW linear amplifier is in use. DU1FLA/Estoy uses the same grounding system. We used a .01 μF / 1Kv capacitor for C1. The combined parallel reactance of this capacitor and the total cable capacitance of the RG-8 transmission line will even decrease further the voltage drop. Also, as the operating frequency goes higher, the reactance of C1 will decrease. Hence, the voltage drop will be even lower. That is, as if the long physical length of coax ground wire is just about less than 1 meter long, electrically (See Table 1). The voltage attenuation curve at higher RF operating frequencies above 7.035 MHz will in fact proceed at the rate of minus 6 dB per octave. This means, when the operating frequency is doubled (14.07 MHz); the voltage that exist across C1 will decrease to ½ the original amplitude. Further, because the center conductor of the coax line is connected directly to earth ground, it becomes automatically your electrical safety ground. How do you like that? What we have presented and discussed dealt only on how we will keep out the troublesome RF energy near our equipment as far as ground loops and RF un-grounded grounds! But how we will make a good and effective RF earth ground to work with the antenna system during transmitting and receiving (Your system needs it whether you like it or not!) is another matter. In order to have an effective propagation for DX work requires a good RF earth ground setup. Merely having improved your equipment ground to earth ground is not a guarantee that you have also an effective RF earth ground….. Another fact! Improving and or making a good RF earth ground to work with your antenna system is another topic that is not covered by this article. Similarly, to answer the anticipated question number 3 also requires a separate topic for another article. Dealing with numerous causes of RFI due to “near field effects” and gross exposure of ham equipment to high RF fields that are not caused by improper grounding systems, though somewhat related, is a separate subject. Available space does not warrant the extension of these topics but hopefully, these will be covered separately in future articles. It is hoped that this article has enlightened the reader to understand the importance of effective grounding paradigms and, the facts and fallacies of grounding in ham radio. To make a shack RF free coupled with sound electrical grounding technique is a responsibility of the amateur operator to address the aspects of grounding when dealing with high levels of RF energy in the operating environment. Effective grounding of equipment is mandatory to address the issues of personal Safety, damage to sensitive equipment and prevention of severe RFI in the operating community. Rated 4 stars based on 99 votes. Article has been viewed 224,514 times. Execution: 1.656. 9 queries. Compression Disabled.